from the framing beneath the seat of the arm-chair, Fig. i, Plate III., and from Figs. 3 and 6, Plate VI. The " inverted," or double, scrolls, already referred to more than once, will be seen, in one form or another, in many of the pieces : Fig. 3, Plate II. ; the top of the chair-back, Fig. 5, Plate II. 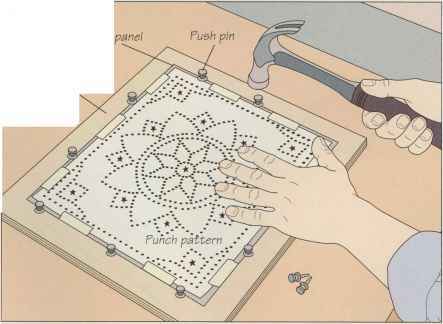 ; in the centre panel of the chair-back, Fig. 3, Plate III. ; as well as Figs. 5 and 6, on the same plate; in Figs. 3 and 4, Plate IV. ; Fig. 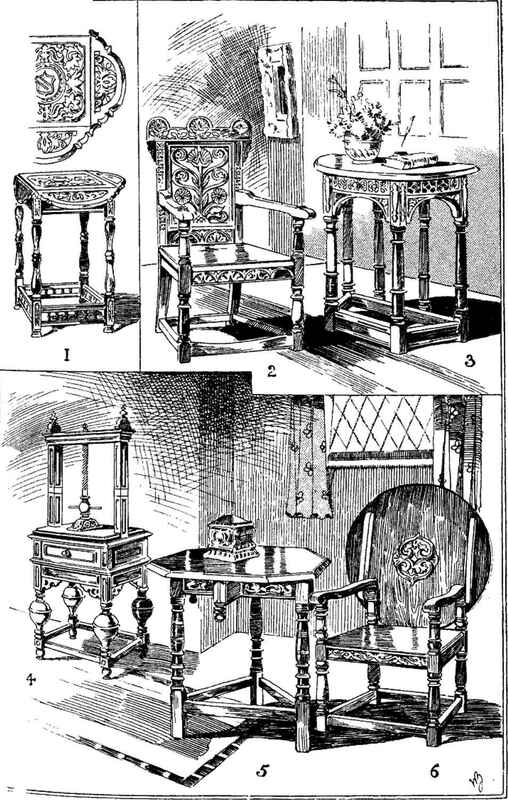 6, Plate V.; and the " Court Cupboard " on Plate VII. The number of these instances of the application of this particular form of detail will prove conclusively that it was regarded with more than ordinary favour by the Jacobean carver. The two remaining chests, Fig. 7, Plate III., and Fig. 8, Plate VI., will be dealt writh in due course. The reader will naturally be curious to see what changes came over the "Court Cupboard" in the course of years, and it will be convenient to touch upon that section of our subject next. As time went on, it was found that the simple chest, convenient as it was in so many ways, had really become insufficient to satisfy the needs of the times, as, on account of considerations of space, it could not be multiplied ad libitum, even in the most spacious home. Useful also as the chest proved for the safe keeping of wearing apparel, linen, and plate, it was scarcely suitable for the reception of eatables such as were frequently in requisition. Hence that prolific parent of the ever-growing family of Invention gave birth to the sturdy offspring which comes next on our list.